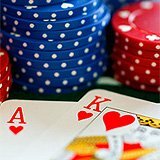 Fibonacci blackjack strategy is one of the popular betting systems for blackjack that is successfully used in other spheres such us versification, music, design, and biology. The strategy originator – Leonardo Pisano also known as Fibonacci – created the numbers’ series that later was named after him. Fibonacci progression is built in accordance with a special mathematical formula, but not to complicate the explanations we will just state the following: every next number in the Fibonacci progression is the sum of two previous numbers. This progression starts with 1. E.g. 1+1 = 2 –> 1+2 = 3 –> 2+3 = 5 –> 3+5 = 8 and so on. 1) If you lose the bet, increase the wager size in accordance with progression. 2) If you win the bet, remove the last two numbers and continue betting the next number. The series ends as soon as you return to one. Your bet loses. You follow the first rule and wager the next number in the progression. Your bet loses. You follow the first rule. Your bet wins. You follow the second rule and remove 5 and 3. Your bet wins. You follow the second rule and remove 3 and 2. Your bet wins – the series ends. If compared to the traditional Martingale system, the Fibonacci strategy is considered to be less risky as the bets size increases more slowly and safe. The tactics allows to make up the losses of the two previous failed bets only. If you lost more than three bets in the series, you will not be able to recover positive balance with one winning bet. That makes this very strategy less profitable (or even non-profitable at all) comparing to the other possible strategic variants in blackjack. Besides, just like the Martingale strategy, the Fibonacci system can meet the deadlock due to the table limits or bankroll shortage.